A skilled facilitator brings some important materials to a meeting including an easel, markers, post-it notes, sticky-dots, chime, a small clock and most challenging of all to carry on a bicycle, a full sized poster board to scribe notes to capture everyone’s good thoughts. As my clients know, I usually carry all of these items to their retreats on my bicycle. Why? Because I love bicycling. Because I just don’t want to talk about sustainability with clients, I want to incorporate it into my own lifestyle. Bicycling keeps me healthy, alert and aware, while saving me money. 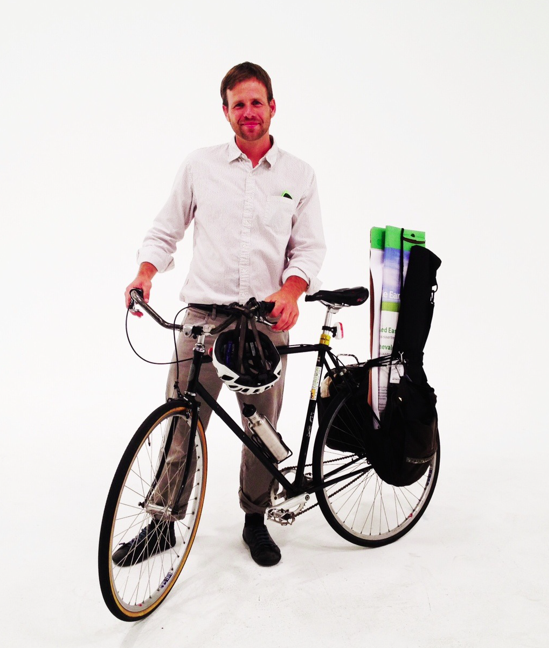 One thing I didn’t learn in becoming a Certified Professional Facilitator is how to carry everything on a bike. I did learn it through trial and error. For me, it starts with two panniers (bike bags) and a rack on the back. 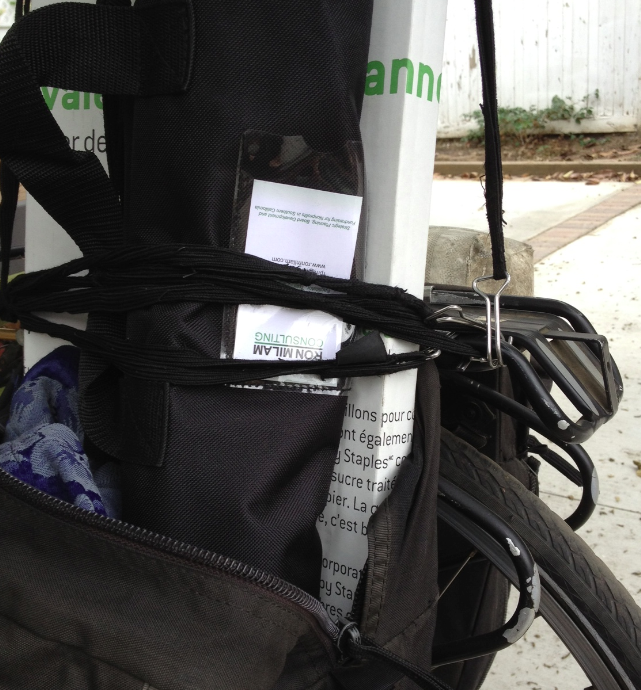 With two bungee cords, I’m able to secure the poster board in one of the panniers if I fold it in thirds. In the other pannier, I put my facilitator bag of tricks containing markers, stickers, etc. On the ride to my retreats, I reflect on what I want to accomplish, refine my approach, let my mind wonder and get some needed physical activity for the day. I also observe and engage with my own city, getting to know its rhythms, people and unique places. I love it. Riding a bicycle is also an excellent daily practice to prepare me for meeting facilitation. On the streets, I need to navigate multiple personalities: bus drivers, motorists, pedestrians, cyclists, light rail and the occasional space shuttle. In the board room, I also navigate multiple personalities ranging from the talkers to introverts. On the streets, I follow the rules of the road. In the retreat space, I uphold group guidelines. On both the streets and around the boardroom, I must be present and in the moment. I need to observe what’s going on, watch body language, listen to what’s said and anticipate what happens next. Because I take care of my own health by incorporating physical activity into my work, I’m better able to serve the group and help them reach optimal health. Even though I no longer direct the Los Angeles County Bicycle Coalition, bicycling continues to play an important role in my own life. Whether its biking to retreats, to the local farmers market or to meetings around town, it’s an essential part of my life in Los Angeles (I have not owned for more than a decade…see artist Diane Meyer’s inspiring photos of 100 carfree Angelenos and you’ll find me in there!). Beyond normal bike commuting, I’ve also bike toured, with the most memorable being my ride from Vancouver, Canada to Los Angeles. For those of you who bicycle around town, thank you. For those who are considering bicycling, I encourage you to start with some short and easy trips around your neighborhood and gradually incorporate it into your lifestyle. 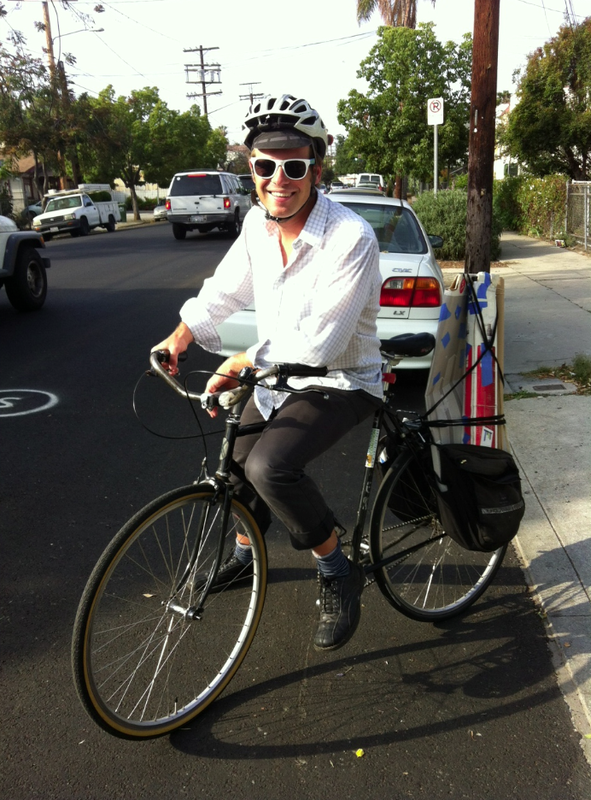 If you see me riding the streets of Los Angeles (often in Echo Park, Downtown, Silverlake and Koreatown) or in Long Beach where I have worked on several projects lately, do wave and say hello. Thanks. Ride on! This entry was posted in Sustainability and tagged Facilitation, Leadership, Sustainability. Bookmark the permalink.